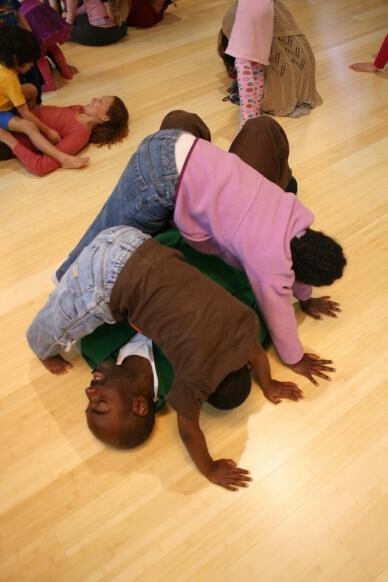 A family performs over and under shapes at a Luna Dance Institute Moving Parents and Children Together class. The Berkeley-based Luna Dance Institute recently won a $120 thousand grant, which will allow it to expand its dance education services for East Bay families. with the goal of bringing together previously separated families within the Alameda County dependency court and child welfare systems. The money comes from First 5 Alameda County, a public entity funded by a state proposition to improve childhood education. "They're working with very high risk families in a totally supportive, non-stigmatizing, fun way," said First 5 CEO Janis Burger, of the MPACT program. MPACT uses dance to work through themes of attachment and separation, specifically designed for families who are learning to live together again after being separated because of issues such as drug use or domestic violence. The program also offers courses in parent education, and plans to bring classes to several Oakland organizations — including the Boys & Girls Club, Magnolia Women's Recovery Programs, Allen Temple Health and Social Services, and Project Pride at East Bay Community Recovery Project — over the next two years. MPACT's free dance classes take place at Oakland libraries: 81st Avenue, West Oakland and Cesar Chavez branches. They are open to the public, and specifically designed to serve families that are under duress for a variety of reasons, such as being separated by immigration status or burdened by a parent's grueling work hours. While the classes are meant for families, MPACT teaching artist and communications manager Cherie Hill noted that the word "family" can include less traditional caretakers such as grandparents or foster parents. "We get a variety of different definitions of what family is," Hill said. "As long as it's a grown up and a child dancing together, they all benefit from the class." MPACT received notice of the grant money in the summer, and launched its first public classes at the Boys & Girls club and 81st Avenue Library in October. In addition to more class offerings, the grant will fund two new teachers and an internship program. The new instructors are in training and will likely start co-teaching classes by winter, Hill said. Luna Dance Institute keeps a current schedule of public MPACT classes posted on its website. The institute also offers classes at its Berkeley location.